Do you have questions about a possible Nursing Home Elder Abuse case? Contact us now using this confidential form. We'll help you get answers. How do I Hire You to be my Nursing Home Elder Abuse Lawyer? Elder abuse refers to intentional actions that cause harm or create a serious risk of harm, regardless of whether harm is intended, to an elderly person by a caregiver. [i] Abuse includes failure by a caregiver to satisfy an elder’s basic needs—neglect—such as ensuring adequate food intake (malnutrition) or fluid intake (dehydration). Physical abuse means causing an older adult physical pain or injury. Emotional / psychological abuse means verbal assaults, threats of abuse, harassment, or intimidation, or causing an older person to feel fear or intimidation. Confinement means restraining or isolating an older adult, other than for medical reasons. There are very rarely good medical reasons for physical restraint or isolation. Neglect is a caregiver’s failure to provide an older adult with life’s necessities, including, but not limited to, food, clothing, shelter, or medical care. Neglect can be unintentional or willful. It can also include neglecting hygiene leading to injuries like urinary tract infections (UTIs) or bedsores (pressure ulcers). Violation of rights means violating on older person’s right to personal liberty, personal property, privacy, voting, or speech. Many states, including Ohio, have nursing home resident rights laws outlining these rights. The signs and symptoms of elder abuse or neglect depends on the type of abuse or neglect, from unexplained bruising for physical abuse to sunken eyes for severe dehydration. With psychological abuse, you may see a person become more withdrawn, fearful, unwilling to talk in an abuser’s presence, or even overcompensating with cheerfulness to avoid revealing the abuse. Physical abuse or mistreatment: Bruises, pressure marks, broken bones, abrasions, burns, and other physical injuries. Look for suspicious bruising (finger marks on arms or legs) or hair loss caused by an injury to the scalp (“traumatic alopecia”), welts, bite marks, or burns. Some nursing home abusers will try to explain these away as simply part of ageing, such as bruising more easily, or more delicate skin. Emotional abuse: Unexplained withdrawal from normal activities, a sudden change in alertness, or unusual depression; strained or tense relationships; frequent arguments between the caregiver and older adult. Neglect: unexplained weight loss, decline, bedsores, repeated UTIs, poor hygiene, being left in wet or soiled garments or linins. Every situation is different. Don’t be embarrassed about investigating possible abuse—asking tough questions, insisting on seeing your family member in private to talk, insisting on being there to inspect skin—or if you missed abuse until it is too late. 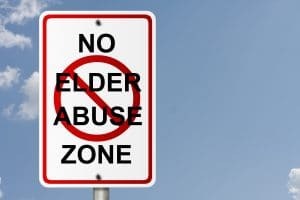 If your loved one has been injured by abuse, contact state authorities (here is a list of Ohio resources) and a nursing home abuse attorney like us in your state. In situations of physical abuse, your loved one may be unable or unwilling to volunteer what is happening to them. This could be because they have been intimidated to remain silent, are embarrassed, or fear retaliation such as being discharged form a facility. That’s normal. Have you ever had your glasses or hearing aid taken from you? Are you afraid of anyone here? Have you gone without food or medicine? Has anyone ever hurt you? Slapped, punched or kicked you? Has anyone ever touched you without your permission? Has anyone ever made you do things you did not want to do? Has anyone taken things away from you without asking? Are you made to stay in your room? There can be fear, shame, or other factors going on that make talking about abuse difficult. When you discuss things privately, and help your loved one feel safe, they will be more likely to open up if there is abuse going on. If you suspect abuse, speak to the nursing home administrator, director of nursing, and / or state authorities. If you’ve confirmed abuse, at minimum the individuals responsible should be investigated and be kept apart from the victim—and ideally any nursing home residents. Identifying underlying emotional or psychological abuse can be challenging. Be observant for evidence of withdrawal, unexplained change in mood, or the refusal by the caregiver to leave the elder person alone—wanting to be sure they cannot ask for help. Withdrawal: emotional withdrawal from family, activities, etc. If you suspect psychological abuse of a loved one in a nursing home, observe the times, dates, and people involved. Report to the director of nursing and administrator. Insist on personnel changes if there are particular threatening people. If they’ve been injured, consider calling a local nursing home abuse attorney, like us, to investigate. You should also alert state authorities charged with investigating nursing homes. Neglect can be difficult to identify. Neglect of food, water, support, medication, turning, and the other day-to-day needs of nursing home residents might only occur occasionally (with certain staff), or might lead to a decline that looks like natural ageing. This is especially with dementia, Alzheimer’s, or other cognitive deficits that make it hard for a person to understand or communicate that their needs are being ignored. Identifying nursing home neglect requires understanding a person’s conditions and needs, and recognizing when they change. This means paying attention to a loved one’s weight, lab results, skin integrity, and other factors. How much are they eating and drinking? What it their urine output? Most families I’ve worked for realize too late that if they don’t watch these things, it is easy for caregivers to ignore them, too. These issues should be reported, not just to a nurse but the director of nursing and administrator. Given the chronic understaffing and profiteering in many nursing homes, the squeaky wheel is more likely to get the grease. Elders are frequent financial scam targets, from telephone scams to door to door salespeople to reverse mortgages. Even worse is when someone in a position of trust, such as a caregiver, exploits an older person to steal from them. Anyone who is unaware of his income or financial matters is at risk of financial exploitation. When someone is missing important identification or financial documents or credit cards, suddenly not paying bills, is spending money on things other than their needs, or suddenly creates a new will benefiting a non-familial caregiver (or family caregiver to the other family members’ expense), there could be elder financial abuse at play. Abuse is preventable. Especially in a place designed to provide care for people who depend on it. But sadly, this is not always the case. No one ever wants to find that their friend, parent, or grandparent was the victim of nursing home abuse. If you suspect abuse, reach out. First and foremost, make sure your loved one is safe and will not be harmed any further. Notify the nursing home’s administration as well as find out what the protocol is when abuse is reported. This way you can follow up and make sure that they are following through. Call the police. Remember, this is a crime and your loved one is a victim. You may also report the nursing home to the agency that monitors, regulates, and fines nursing homes. Ultimately, if you want to hold the nursing home accountable, it will be important to contact a knowledgeable nursing home abuse attorney. 1. What is considered nursing home neglect? It can be difficult to comprehend nursing home abuse and neglect if you have never been exposed to it. Neglect and abuse are similar yet different. There is the law. Ohio Revised Code 2903.33 states that neglect is recklessly failing to provide a person with any treatment, care, goods, or service that is necessary to maintain the health and safety of the person when the failures result in physical harm or serious physical harm to the person. The Ohio Revised Code also outlines abuse, gross neglect, and the inappropriate use of a physical or chemical restraint, medication, or isolation. Nursing home abuse is a form of substandard care that causes harm to the resident. It is more about a breach of duty. But, similar to abuse, neglect affects victims on emotional and physical levels. For example, a resident may not be properly bathed or care for in regards to hygiene. In some cases, this leads to infections and sores. Another example is a nursing home failing to adhere to a resident’s diet restrictions or providing them with proper medication. 2. Are there any legal consequences for acts of abuse or neglect in a nursing home facility? The simple answer is yes. There can be criminal and civil legal consequences for acts of abuse or neglect in a nursing home. They can often times occur simultaneously. 3. If I suspect that my loved one is being abused or neglected in an Ohio nursing home, what should I do? There are specific steps that you should take if you suspect your loved one is being abused or neglected in a nursing home. First, it is important to make sure that your loved one is safe. If you feel that there is something criminal going on, contact your local law enforcement. Next, it is important to obtain documentation. What is making you suspect abuse or neglect? Take photographs, obtain statements, make sure to document specifics like dates and times. It is also important to report the abuse or neglect suspicions to administrators. Find out what the policy is for investigating such claims. Check in to make sure that they are following protocol. Ask to be kept informed as to what is happening. Document, document, document. 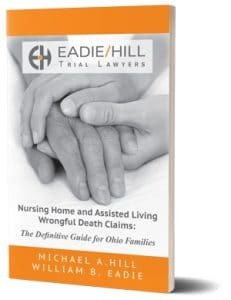 4. Who regulates Ohio nursing homes? The Ohio Department of Health licenses nursing homes, transitional care facilities, and rehab facilities. The division of Quality Assurance conducts on-site surveys to verify that facilities meet state and federal rules. The Ohio Department of Health has recently launched their Abuse, Neglect, Misappropriation, and exploitation (ANME) Program. For more information, visit their website here. [i] Elder Mistreatment: Abuse, Neglect, and Exploitation in an Aging America (2003). National Research Council. The resident was admitted to a hospital on Oct. 14, 2017, the day after being discharged from the facility, with a stage 3 pressure ulcer that measured 13 centimeters by 5 centimeters, according to DPH. When the resident was admitted to the facility on Sept. 18, 2017, “moisture-associated skin damage” was noted, according to the citation, but the injury progressed to a stage 2 pressure ulcer by Oct. 9. An investigation found records were incomplete and failed to show the resident was properly medicated for the wound, DPH said. It showed a staffer at the nursing home check on him, then leave. Later, it showed workers discovering that he was unconscious. Even later, it showed them calling 911 for help. The video also showed a moment someone laughed as nurses struggled to get Dempsey's oxygen machine to work. Elder abuse is real and it is more common than one might think. It is difficult to think about but it is a reality that as a society, we must be aware of and prevent such senseless crimes from occurring. Dempsey's family had placed the hidden camera in his room because he had been anxious about staying in a nursing home, his son reported. The son said Dempsey knew it was there but the nurses didn't — and it would become instrumental in building a case against the home and the workers after the veteran's death. Another article from Atlanta WSB-TV 2, reports that the morning that Mr. Dempsey died, he can be seen on six occasions pressing the "call/help" button. This would be an extremely legitimate reason for concern. It is the care facilities duty and obligation to respond when these calls are made.